Bobcats walk our trails daily. Every time we get fresh snow, I see their tracks. Then, in the days after the snow fell, the bobcats walk in my fatbike tracks. I love seeing their little paw imprints in my tire tracks. 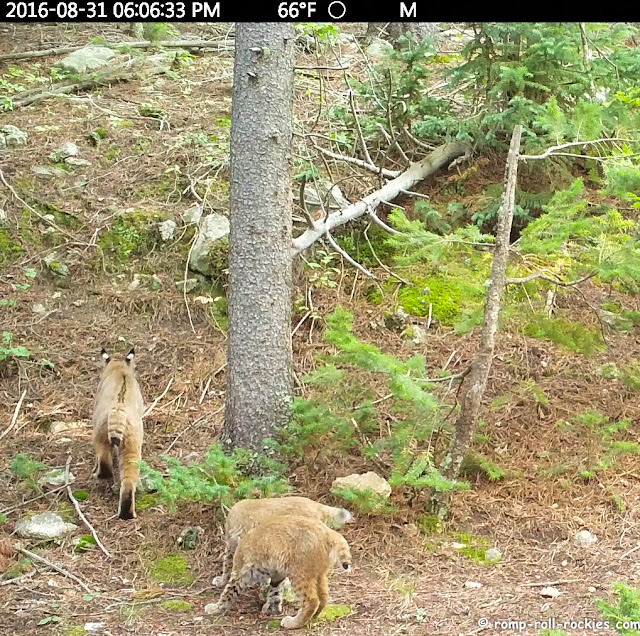 I get photos of bobcats on my trail cams so frequently that I never post some of them - I file them away under the keyword "bobcat". However, the mother bobcats do catch my attention. 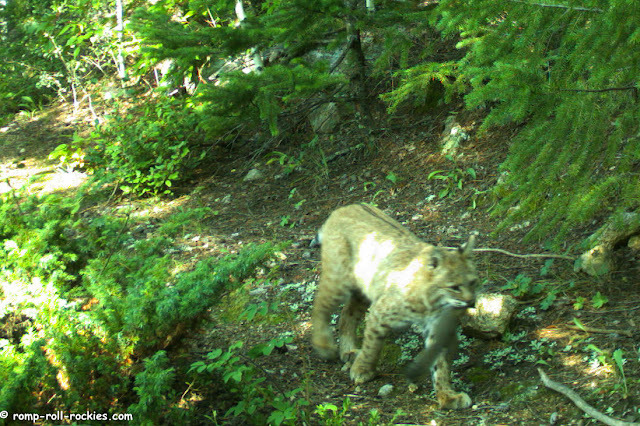 Most summers, I capture photos of them carrying prey to the dens where their kittens are cached. This one is carrying a squirrel. And this one is carrying a rabbit, reportedly their favorite prey. 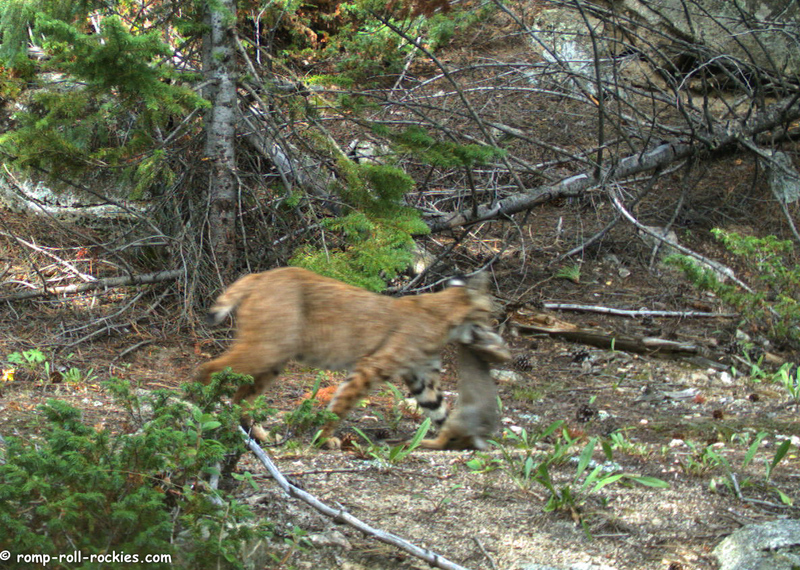 When they're carrying prey, they are cats on a mission, moving fast, which means that the photos are often blurry. Some years, I get the treat of footage of the mother bobcats moving their kittens from one den to another, like in this frame from a video of a bobcat family. The reason why the trail cam is in this position is that there is a bear marking tree in the picture. It is the small pine to the right of the frame. I've found that bear-marking trees frequently turn into generalized marking spots, perhaps provoked by the scent of the bear urine at the base of the tree. In this photo, the two kittens and their mother were obsessed with a rock in the general vicinity of the base of the tree. And, they played with each other while rolling around on the ground. Although this happened in the summer of 2016, I never shared all of the footage of the family playing in front of my camera. I decided to do that today. Over the past months, I've made a habit of sharing wildlife photos and video early in the week, usually on Mondays. In the winter, the wildlife activity decreases dramatically so I may pull out oldies, like this one, that I didn't share previously. 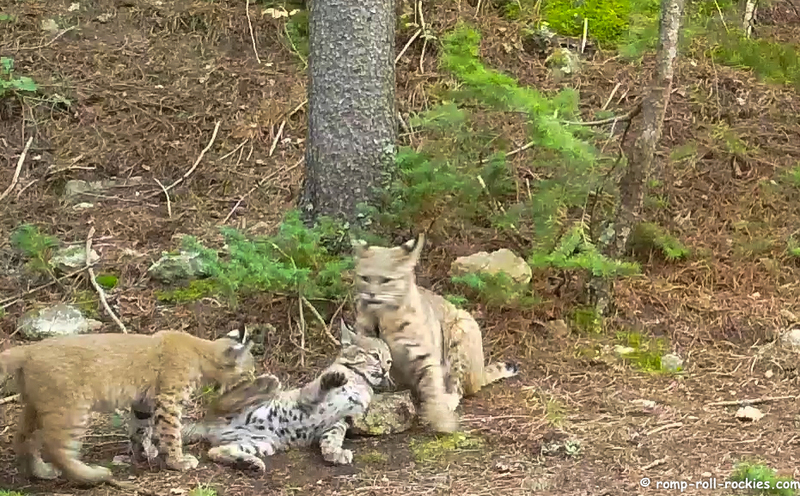 I hope that you enjoy watching the bobcat family! (you can also watch it at Youtube). truly wonderful to see them play, and domestic kittens are so similar. Those markings, the ears, the looks, thanks so very much for sharing, we see through your trail cams life at a whole new level. Cutest video EVER! I wonder if that rock is a catnip rock!?! 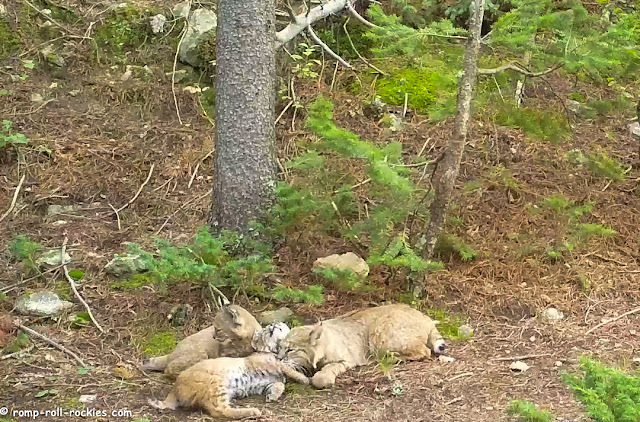 I strive to get pix of bobcats on my cams here in NY, but see very little, mostly at night, slightly blurry :( With 14 cams out you'd think there would be more sightings. Love seeing all your wildlife though! I love bobcats, they are so dang cute. You're lucky to get such intimate photos of them. What a sweet video. There must have been some interesting scents on that rock. As always, thanks for the share. The bobcats are so beautifuly marked! The kitten are so cute and I love the spots on their tummies! It's wonderful to see them just being themselves! Can't believe you can get to a point where you're blasé about animals...oh, just another bobcat! These photos and the video are so cool! Oh my goodness! I loved watching that!!! How wonderful to catch glimpses of the Bobcats! Great footage. Wow, you sure have captured some wonderful footage! I love their ears...I didn't realize they had those markings. And those spotted bellies....adorable! 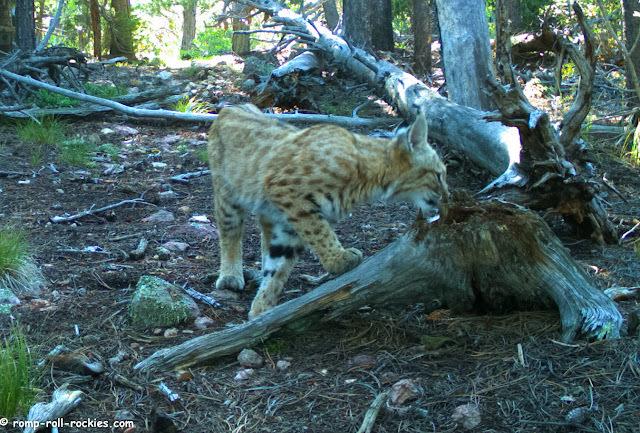 Love the ears and marking on the Bobcats. Nice to know they love wabbits just like my sisters and me! Thanks for posting this, Ma needed an Awwwwwwwww today! That is so neat. I've only seen a bobcat on my hikes a few times.